When your favorite Wild Game season comes in. Call or Stop by Holsinger's to find out about the many great services that are provided for the cuts and species of the game animal that you desire to have processed. Due to local hunting regulations, possession tags and or confirmation numbers distributed by the state hunting regulator must be present to have game processed. We appreciate your business, but must follow the regulations so please safeguard this important information for your game meat as long as you possess it. To ensure safe and clean products for you and all of our customers, all carcasses must be properly field dressed, and will be inspected upon arrival, and additional charges may be placed for unclean carcasses. To be fair to all customers a good faith deposit of $20.00 will be required on ALL wild game orders. Thank you to all of our customers for understanding. Due to extra handling and product logistics, there will be an additional charge for processing Cut Only Orders of $5.00 per order this will be in place of any wrapping charges that might have been incurred. 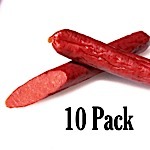 Due to our high volume, and goal of delivering our finished product to our customer as quickly as possible; we use batch processing and cannot promise that you will get your own meat back. However we take great pride in our products and process them with utmost care. Beginning February 1st through August 31st, Custom batch processing will be available upon request. A minimum of 25 lbs. will be required for custom batch processing. Processing time will vary (Approximately 7 - 21 days). You will be notified upon completion of your order. Please pickup order within 5 to 7 days. You must present your claim check ticket to pick up your finished game order.